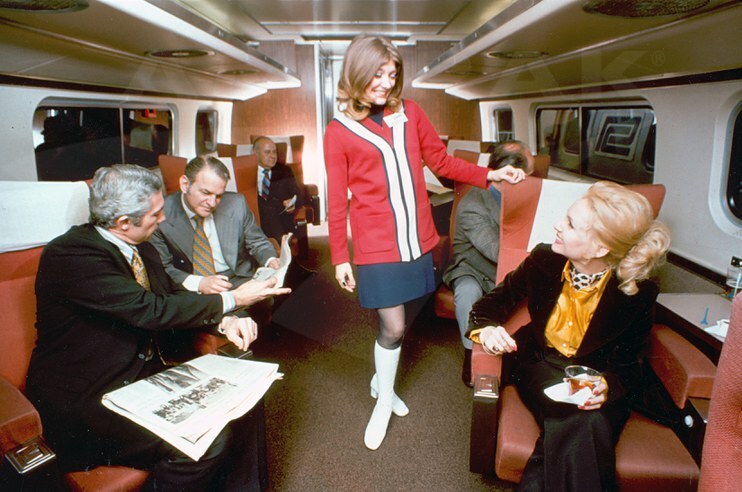 Tricia "Patty" Saunders, shown here assisting Metroclub passengers, wears the new Amtrak uniform introduced in early 1972. That same year, Saunders was asked to serve on a national public relations tour as Amtrak neared its first anniversary. Traveling with representatives of the company’s public relations firm, Harshe-Rotman & Druck, Inc., she visited more than 60 cities in six months. “It was exciting to me, seeing the country and meeting all kinds of people,” says Saunders. In articles appearing in a wide variety of newspapers, Saunders mentioned the company’s improved on-time performance, local enhancements to passenger rail service, car refurbishment program, new Amtrak vacation packages and the launch of a computerized ticketing and reservation system. Following two years as a PSR, Saunders became a sales representative in California, but then headed east again to work as a specialist - station services at Amtrak Headquarters (then located at L'Enfant Plaza in Washington, D.C.). She subsequently served as a station supervisor at Washington Union Station. To pursue a long-held dream of acting, she left Amtrak and returned to Los Angeles. Saunders worked at the famed Brown Derby restaurant in Hollywood while part of a local theater group, and she was in numerous productions. 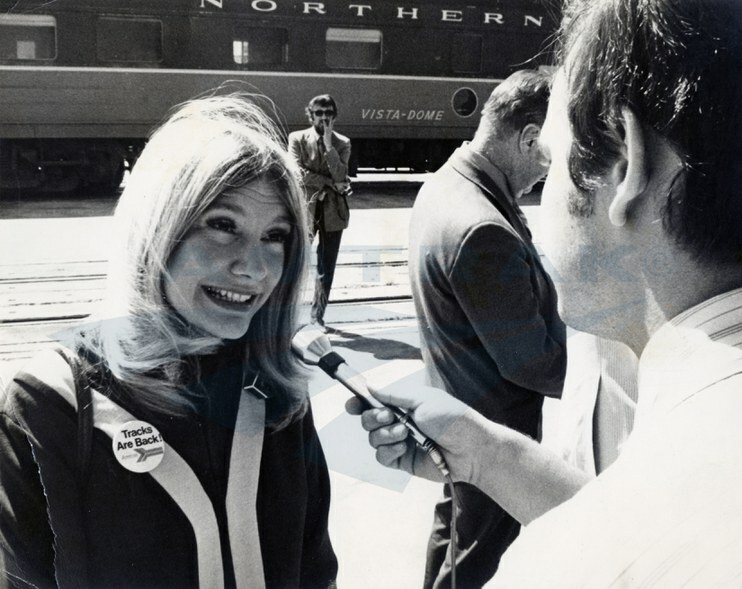 Tricia Saunders speaks with a reporter during a 1972 national tour to mark Amtrak's first year of operations. Within a year Saunders was back at Amtrak, this time as an onboard service (OBS) employee, a position she held for the remainder of her career. Train attendants work on coach or sleeping cars. In general, they greet passengers at each station, assign seating areas, assist with luggage, keep the car spotless and answer general questions—from describing passing landmarks to giving a preview of the dining car menu. In addition, a sleeping car attendant makes up the beds in a Roomette or bedroom, ensures that shower areas are stocked with towels and toiletries and may also deliver meals to a passenger’s room upon request. Saunders especially liked working the many long-distance trains, including the California Zephyr (Chicago-Emeryville, Calif.) and Empire Builder (Chicago-Portland/Seattle): “At night, you can look out the conductor’s window and see the magnificent stars and simply enjoy the amazing views.” Over two decades, she interacted with a wide range of people from around the world, including singers Ella Fitzgerald and Dolly Parton, actor Michael Gross (who played Steven Keaton on popular 1980s sitcom Family Ties), sportswriter Bill Madden and a guitar-playing conductor who later made professional recordings. The ferocious winter of 1995-1996 stands out, for it included a run in which the Empire Builder was stranded for more than a day at Fargo, N.D. Whiteout conditions had halted passenger and freight rail traffic—and the entire region. Saunders remembers that the onboard chief ventured out with the local sheriff to find groceries as the dining car’s food supply ran low. 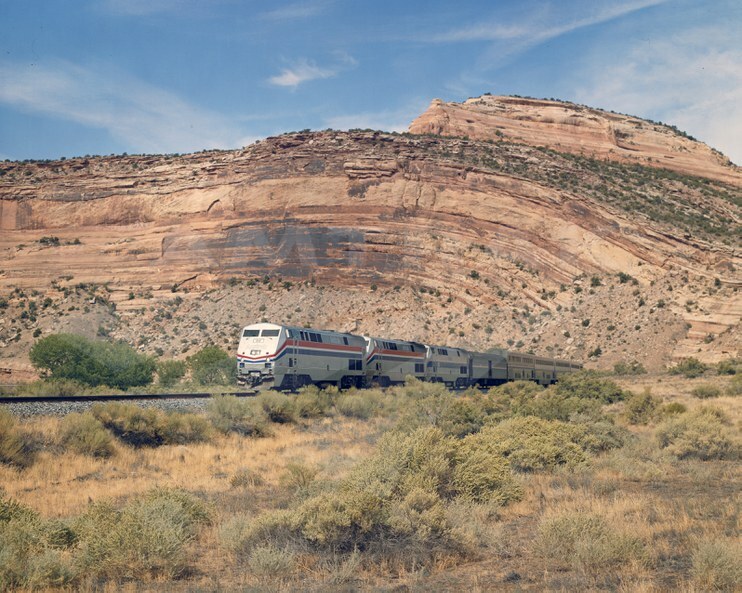 Tricia Saunders later worked as a train attendant on the California Zephyr, shown here near Shale, Colo. Many of her best memories relate to her coworkers: “Crews get very close and it was sad when the group would break up, but that was an opportunity to make new friends. By the end, I knew somebody on every train.” Social media has provided new ways for Saunders and her former Seaboard Coast Line and Amtrak coworkers to reconnect. 1 “Amtrak ‘Stewardess’ Optimistic On Railroad Industry’s Future,” St. Paul Dispatch, April 5, 1972.